Blizzard Entertainment, maker of World of Warcraft, StarCraft and Diablo, comes to Comic-Con each year armed with all-new things for fans to rabidly consume. 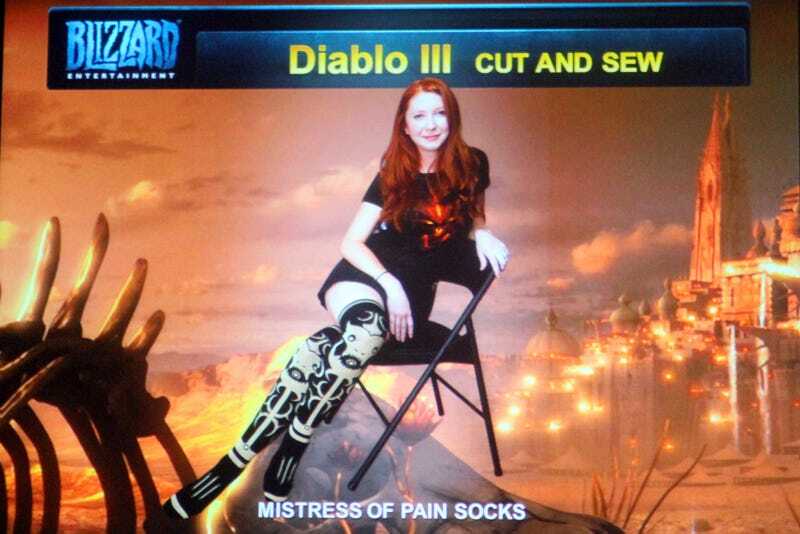 From books to belts to food to thigh-high demon socks, Blizzard and its partners innovate new ways for fans to spend, spend, spend. Plenty of things for fans of Diablo to wear, including a very nice looking Tyrael hoodie and a Demon Hunter-inspired coat. WoW elixir, StarCraft and Warcraft Mega Bloks, novels, graphic novels, trading cards and much more. The video game maker and its partners—DC, Jinx!, Cryptozoic Entertainment—showed off the good coming through 2012. Of note for the Blizzard loving literature enthusiast, Blizzard Entertainment's Chris Metzen said at today's Comic-Con panel that the novel StarCraft: Ghost: Spectres is essentially the novelization of the indefinitely on-hold (canceled?) video game StarCraft: Ghost. Metzen also said that the company's upcoming Diablo book will focus on the events that occur between Diablo II: Lord of Destruction and Diablo III.